It’s time to make basic protections for women refugees a priority! Can you imagine not eating or drinking to avoid being watched by men as you shower or use the bathroom? Or being too frightened to sleep because of unwanted advances from single men sleeping in the same crowded spaces at night? These are some of the daily realities faced by many refugee women as they travel alone or with young children in tow as they try to reach places of safety for themselves and their families. In early June 2016 the bodies of another 117 migrants – most of them women – washed up on a Libyan beach, marking another deadly day in the ongoing Mediterranean refugee crisis. More than 1 million refugees and migrants entered Europe by sea over the Mediterranean in 2015, three times the number that had made the same crossing the year before. The majority of those braving the world’s deadliest migration route are fleeing armed conflicts and violence that have torn apart their homes and societies – with Syrians accounting for half of these numbers. Thousands more have traveled from Turkey into Bulgaria and Greece by land during the same period, with women and children currently making up half of the migrant population. 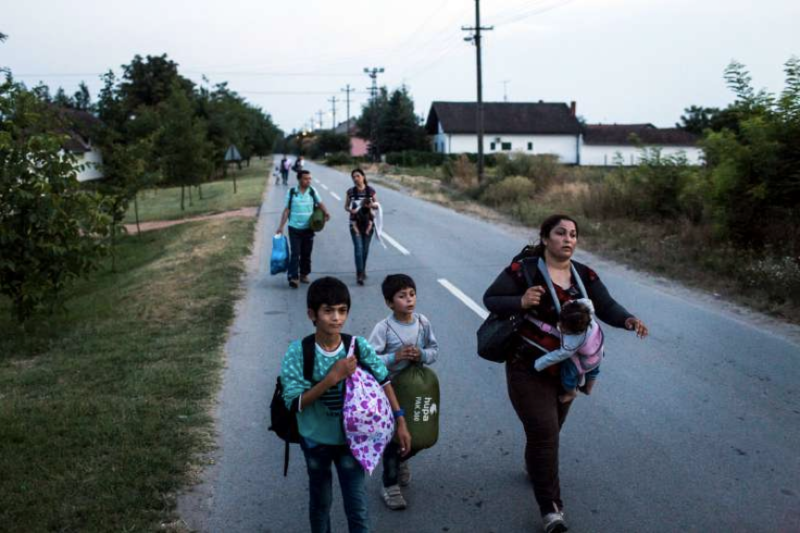 These women, many of whom are traveling alone or as heads of their households with their young children or family members, are traversing hundreds of miles in the hope of finding peace and safety in mainland Europe – only to be faced with threats, violence, exploitation and harassment during every stage of their journey. Earlier this year, Amnesty interviewed 40 refugee women and girls in northern Europe who had travelled to the Balkans via Greece and Turkey. Many women traveling alone or with their young children told us they felt constantly vulnerable and afraid as they slowly made their way to what they hoped would be a place of safety. But in braving this arduous journey they have been intimidated, leered at, and targeted by smugglers, uniformed guards, and fellow refugees along the way or in transit camps. Daily acts which we take for granted, such as sleeping in peace and going to the bathroom, become fearful and weary experiences for many female refugees, for whom basic safeguards have not been put in place. “I never got the chance to sleep in settlements. I was too scared that anyone would touch me. The tents were all mixed and I witnessed violence… I felt safer in movements, especially on the bus, the only place I could shut my eyes and sleep”, Reem, a 20-year old from Syria who was travelling with her 15-year-old cousin. All of the women told Amnesty that they were constantly scared during their journey across Europe. The daily negotiations women and adolescent girls have to make – for physical and sexual safety when securing food, water, shelter or clothing – are exhausting. Women traveling alone are not only targeted by smugglers seeking transactional sexual favors in exchange for quicker or cheaper transport, but also feel physically threatened when sleeping in facilities surrounded by hundreds of single men. Several women also reported being beaten or verbally abused by security officers in Greece, Hungary and Slovenia. A recent UNHCR assessment report on The Risks for Women and Girls in the European Refugee and Migrant Crises reiterates that sexual exploitation and harassment of women and girls remains a daily reality, and that the current response to the crises is unable to prevent or respond to sexual and gender-based violence in any meaningful way. Farah, an Afghan refugee travelling alone through Europe with her eight children, seven of whom are girls under the age of 17, told UNHCR that they had left Iran – where they had been living as refugees – after her husband and son were killed, leaving her and her children vulnerable to attacks. The children’s uncle threatened to sell Farah’s daughters for marriage and Farah felt she had no choice but to flee the country so her girls could be protected. Early and forced marriages are a common occurrence amongst the female refugee population – especially for those girls living in refugee camps in Iraq, Jordan, Turkey and Lebanon. The Zataari Refugee Camp in Jordan is one of the largest refugee camps in the world, with an estimated population of nearly 80,000 refugees, half of whom are women. Despite efforts by host governments and the international community, formal refugee camps remain overcrowded, understaffed and unable to fully meet refugees’ needs, in particular those of women. Families are increasingly opting to marry their daughters at a young age as they struggle to survive off limited resources and want to protect their girls from sexual violence. In Syrian refugee communities in Jordan, child marriage has dramatically risen over recent years, with the number of registered marriages involving a girl under the age of 18 rising from 12% in 2011 to just under 32% in the first quarter of 2014. There have been similar reports of increases in child marriage in Syrian refugee populations in Iraq, Lebanon and Egypt. Early and forced marriages can have far-reaching negative consequences. A recent IRC report on women and girls affected by the Syrian conflict confirms that adolescent girls are being forced to marry at younger ages, are exposed to more violence in and out of the home and find it increasingly difficult to access services such as health care. Girls who get married at a young age are also more likely to stop going to school, adding to the more than half a million Syrian refugee children which UNICEF estimates are no longer in school outside of Syria. This is in addition to the 2.6 million who are no longer in school in the country as a result of the ongoing conflict. This leaves many girls isolated and uneducated, making them far less able to take advantage of economic opportunities, and leaving them dependent on their husbands even in the face of domestic violence. Let’s work together to ensure that all refugees and migrants are free from all forms of exploitation, harassment, violence and abuse. We need to drive the humanitarian community’s will to prioritize the needs of refugee women and girls in particular, in order to ensure that accessible and responsible safe spaces, and basic safeguards for women and girls are created along the most populous migrant routes. To show your support for all refugees, take the Amnesty pledge to #standwithrefugees and help combat anti-refugee rhetoric by telling Congress to increase the overall number of refugees that are resettled in the United States. Speak out for refugee rights by encouraging your governments to bring the interests of women and girls to the forefront and focus on basic safeguards for women refugees now! This entry was posted in Refugee and Migrant Rights, Women's Rights and tagged Women Refugees, women's rights, World Refugee Day by Guest Writer. Bookmark the permalink. Have You Seen What’s Happening to Syrian Refugee Women and Girls?